Being funny isn’t easy. Being funny in a still image is even harder. Here’s a basic guide, and some pieces from Art Lords that nail it. We’ll then dissect why it functions well as a humor piece (which will make it no longer funny, but hey). A joke, in its essence, is a communication that 1. Sets up expectations, and then 2. Subverts them somehow. Stand up comedy, slapstick, and knock-knock jokes all express this. Fat Heroes Fantastic Four is a good piece to explain this definition of a joke. We’re used to pieces that focus on a team of superheroes, typically they’re framed in a way that we can see each person individually, but then also consider them all together as one. Where joke comes in is that all the superheroes are…well, fat. 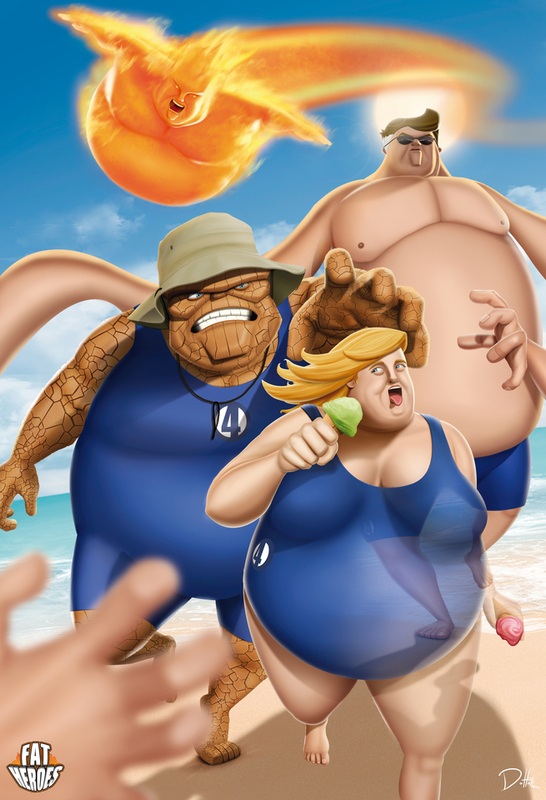 Rather than fighting a villain or moving across a city, they’re on a beach and fighting over ice cream. This subversion of our expectations makes the piece funny. Some humor is a bit more subtle, or requires more context to see the expectation. This shot is the same as the famous illustration of the Founding Fathers in American History, but they’re the classic cartoon characters who made animation part of television experience. Worth it. A bit darker, this is similar to the Fat Heroes piece from before. Batman, obviously fat and retired, is watching a TV program we can’t see. But what he can see is the Joker’s head stuffed and mounted on batman’s wall. This is great because it is 1. A funny subversion of the batman narrative, and 2. Makes us wonder more seriously about what happened to make Batman finally snap and kill the joker. You can find other funny posts on ArtLords, just search humor.